The Grand Trunk is MARK + VIVI`s latest project located in the transitioning neighbourhood of Pointe-Saint-Charles, Quebec. Nestled steps from Montreal’s Lachine Canal, the newly renovated 1,100 square foot row house currently serves as residence and design studio for designers Mark Fekete and Viviana de Loera. Originally built in 1880, the building’s exposed structure supports a whimsical integration of traditional industrial materials with clever and efficient design. As in previous work, sustainability continues to guide Mark+Vivi’s design efforts. Rather than shipping construction waste off to landfill, demolished framing and floor boards find new life as rugged yet tasteful furniture, cabinets, and counter tops. Steel columns and beams are added to support the existing timber frame structure. Left exposed and painted white, the new “bones” not only lift but gracefully compliment the old. 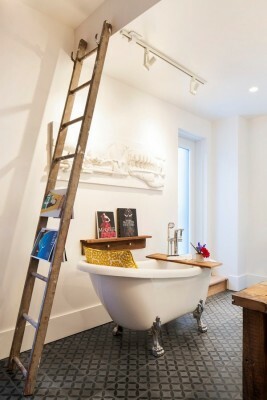 Pleasantly unexpected antique finds during demolition helped influence the design process of various spaces throughout. 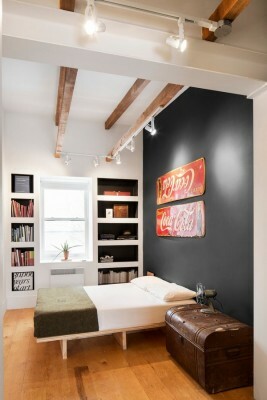 Uncovered were old toys, antique tools, and vintage enamel signs that now play an integral part in the home’s decor. MARK + VIVI is an interdisciplinary design-build studio based in Montréal, Canada. Co-founders, Mark Fekete and Viviana de Loera, are two designers who began their collaboration after graduating from California Polytechnic State University in San Luis Obispo where they both received degrees in architecture. The Grand Trunk utilizes natural light extensively. A skylight was added on the second floor above the stairs. The building’s compact size means that small amounts of energy are required to heat or cool the interior. Mineral wool insulation was installed throughout. 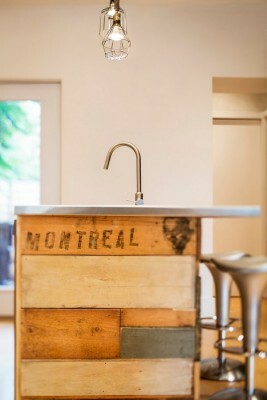 Floors, shelving, and kitchen cabinetry are built using locally sourced Canadian plywood. 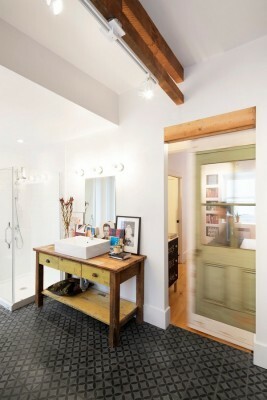 Bathroom cabinets and countertops are built using wood reclaimed on site during demolition. Painted and exposed surfaces such as floors, walls, and cabinets are finished in low VOC treatments. All existing doors and windows are replaced with double glazed low-E units. Electric base board and convection heaters are used at both levels. Cooling is provided via two energy efficient (12,000 btu) interior wall-mounted inverter ducted units. An independent energy consumption analysis found The Grand Trunk consumes approximately 20% less energy than similarly sized homes in the city. New construction of comparable projects in Montreal costs from $250-300 per square foot. The Grand Trunk was completed at a cost of $205 per square foot. Acting as designer and general contractor helped with significant savings.